Success upon Success! First, nothing can happen in a Lebanese context, and especially in a Maronite Parish, without Mar Sharbel, the Sign of the Cross, Jesus and Mary, the Blessed Sacrament, Saint Rafka and all the Saints. Literally. The Colorado Lebanese Festival blends these key elements of our Faith with our Food, our Family, and the Fun we have when we all come together. Every year at our Festival, our multi-generational families come together with good friends and grow our Traditions, our generational memories, and our Families. They grow like the Cedars of Lebanon, rooted in the Gospel. Moreover, the Festival allows our Values of Food, Faith, Family, and Fun; and our Cultural Traditions to reach out to our neighbors with a spirit of solidarity, joy, and prosperity, regardless of color, religion, race, culture, language, or politics. 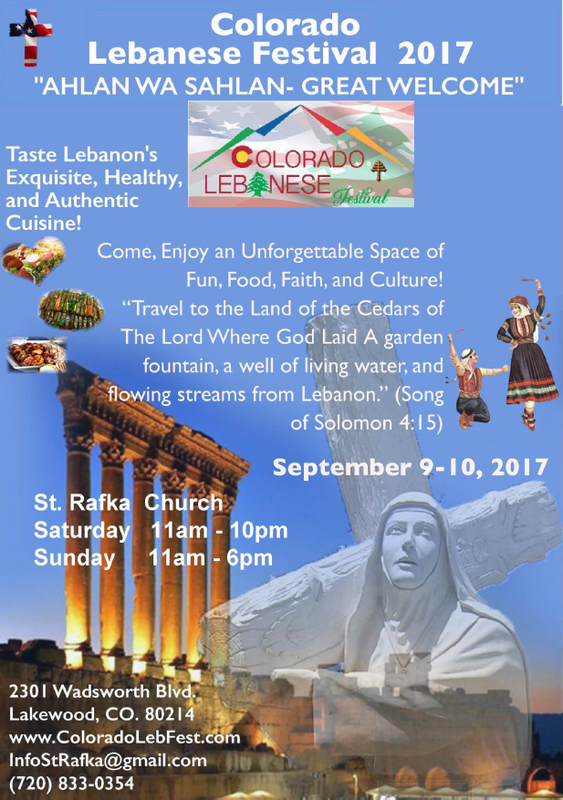 The Festival also shows our great team work as the St. Rafka Mission of Hope and Mercy step forward to assist the Church of St. Rafka with the preparation and announcement of the Colorado Lebanese Festival 2017. Through the Mission, I was able to announce our festival from the pulpits at many area churches and at wider events, like the Western Conservative Summit. Even my little dog, Bella, did her part going out in the mountains, making new friends, and creating opportunities to invite even more people to come to the Colorado Lebanese Festival 2017. Thanks to Gerard Abiassaf and Phillip and Heidi Kyburz, of course! Saint Rafka Parishioners are from everywhere, and speak many languages. We represent many cultures and come from many religious background. We pray in the language of Christ. As Maronites, we are proud to be called the heirs of the apostles and the first community to be called Christians! Our duty is to evangelize yet, also to share with the Muslim and Jewish Worlds of the Middle East the Faith in the God of Abraham! We promote the love of God and the love of the neighbor by being faithful to our Judeo-Christian and Phoenician roots! We extend love and share heritage with the Arab world in all its diverse religious groups and ethnic entities by living faithful to our values expressed in our religious freedom and expression of Faith, Hope and the Great Christian Love! Maronites are called: “Beit Maroun”. House of Saint Maron! For, wherever we go in the world, we don’t lock our doors to the needs of the neighbors, but we invite them to our church and we share with them the ownership of the Divine Message of Salvation! We mingle with everyone to bring about Unity and Peace, Freedom and Prosperity! “Blessed the person who hangs out with Lebanese People” I heard people saying many times, for they will never go hungry, will never not have friends and family, AND will never have to pay for their bill at a restaurant! OOOOOOOOOOOO! EXCEPT for this Time: We need your help and anticipate your great support and contributions to pay for the Great FOOD at the Colorado Lebanese Festival 2017, and to assist us in our ministry that we do here in Colorado and abroad! Trust me, with all the activities that you will experience at the Colorado Lebanese Festival 2017 is going to be like the Dream of your Life! They enjoy their work with rewarding Faith in the God of Heaven! “Anything for Saint Rafka,” they exclaim! They cook for weeks and weeks leading to the Festival. They stand for two full days serving food and greeting people! And guess what, they are the first ones on the dance floor to lead the dabke step line dance after all of this! What a Great People who know how to share the best experience, the greatest FOOD, FAITH, FAMILY and FUN! Thank you to Maya Kadi, this year’s Festival Chair, her committee members, and all our parishioners. I am so proud of them and honored to serve as their pastor! God bless them all. May God bless Saint Rafka Parish and all her children, parishioners, contributors in time, talent, treasure and cooking! May God bless our visitors who from now on will become: our family! Saturday will conclude with the Hafleh, or the Lebanese Night Music and Dance Party starting at 7:00 pm until 10:00 pm. MASS FOR THE MARTYRS at 9:30 am, with the Knights of Columbus! SPECIAL TALKS: Coffee with Fr Andre: a special time where you can participate closely and learn about the important work the St. Rafka Mission of Hope and Mercy is doing here and in the Middle East to Save, Educate and Aid, the Christian persecuted and other minorities in the Middle East. Dance for Life Show and the Sing-Along Lebanese and American Music and Dance. A special event and a New Feature of the Colorado Lebanese Festival 2017.